A breakthrough finding could solve the mystery of conscious thought. Back in the middle of the 19th century, a physician named William Carpenter theorized that a part of the brain called the sensory ganglion was the “seat of consciousness.” He was wrong — we now know that what he called the sensory ganglion, since renamed the thalamus, is more of a switchboard for most of our senses. But the mystery of where consciousness comes from remained unsolved. Now we may finally have an answer. 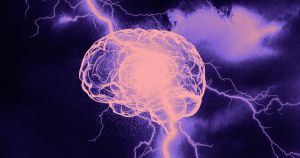 An international team of neuroscientists from universities and hospitals spanning the Americas and Europe say that they’ve determined the neurological signature for consciousness. Rather than a specific chunk of the brain that’s responsible for consciousness, the researchers say they’ve located a brain-wide pattern of activity that’s only present when people are awake and responsive. To track down the elusive consciousness pattern, scientists scanned the brains of 159 people from Liège, New York, Ontario, and Paris using a Functional Magnetic Resonance Imaging (fMRI) system, which is a common tool in neuroscience research that reveals not only the structure but the activity levels of someone’s brain. They studied healthy people who were instructed to focus on a mental task, as well as those same people when they were more relaxed. Their brain scans were compared to those from comatose people who were left with unresponsive wakefulness syndrome after a brain injury as well as people who were awake but unresponsive after a brain injury and people who were in a minimally-conscious state, which served as a middle ground between the comatose and conscious participants. The findings, published in the journal Science Advances on Wednesday, describe how those brain scans let the the team of neuroscientists isolate four distinct patterns of neurological activity that correlated with a person’s level of consciousness. The first pattern, and most complex, showed high-level, efficient coordination across wide swaths of the brain. This pattern was more prevalent in participants who were awake and healthy but less so in participants with unresponsive wakefulness syndrome as well as those were in a minimally conscious state, according to the research. In contrast, a separate pattern emerged in unresponsive people’s brains that was less complex and more linked to specific brain regions, suggesting a lower level of coordination within the brain. The other two patterns, the researchers suggest, exist as transition states between the two other patterns. Ultimately, the researchers concluded, consciousness stems from the ability of the brain to process information using its various specialized lobes and cortices in concert. Meanwhile, when in less conscious states — or, their research suggests, when a conscious person loses focus — brain activity is more isolated and limited to the specific, local connections within and between parts of the brain. The work needs to be further vetted — the team of neuroscientists conclude its paper with a call for research into how these patterns can be altered through injury, drugs, or other factors. But going forward, we finally know where to find the brain activity that lets us experience the world.